Rhododendron austrinum 'Millie Mac' is finally flowering. 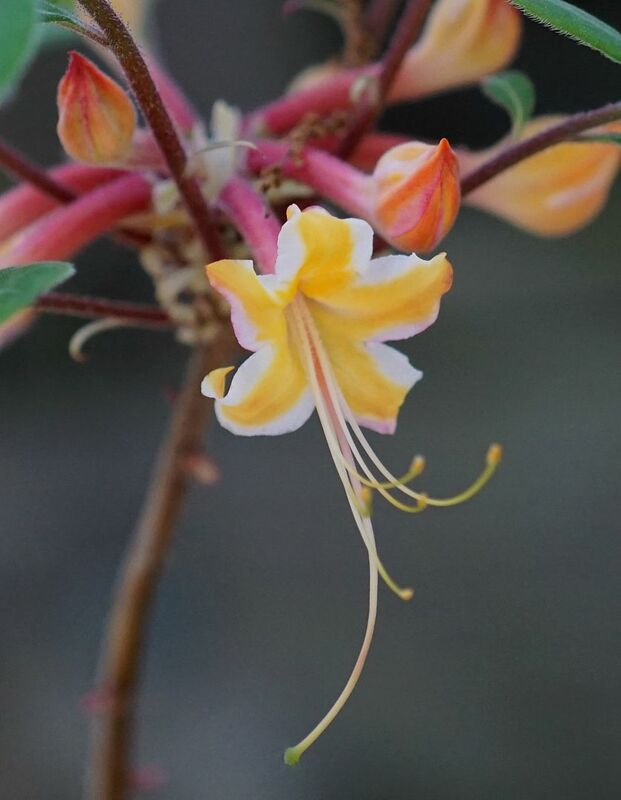 I've had this shrub in my garden for a few years now and it finally decided to send out some blooms. R. austrinum is a southern species but that shouldn't have been a problem because the nursery I bought it from is north of me and they have fields of it! A lot went into preventing this shrub from flowering sooner. It probably needs more sun but also wasn't that good of a plant to begin with. I bought it on a garden tour form a wholesale nursery. Basically we were given a tour of a farm and allowed to pick out plants as we went along. I had my heart set on this particular cultivar and picked out the very best one there. However, a women who was also on the tour didn't know what to buy so I talked her into trying this one a try. Well, she picked the very worst one imaginable! There were dead branches in the thing, it was an irregular shape, and frankly I think it should have been thrown in the compost. Well the tour ended with us all eating lunch at a different facility and she left before I did... and took my plant... probably on accident. To be fair, I have no way of know if the plant I picked out would have fared better. It probably is a lighting issue because it's 5' tall now and only now decided to flower. 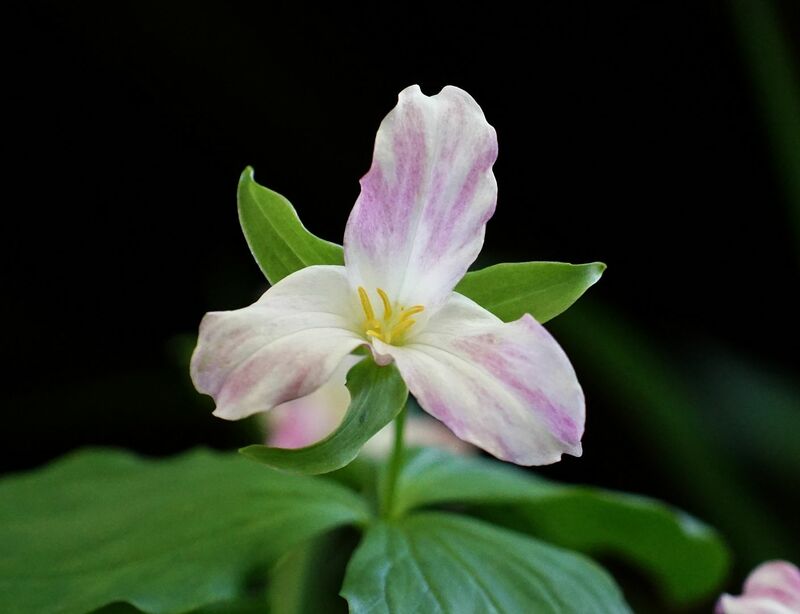 A single Trillium cf. erectum. I'm told this is actually what the flowers look like on young plants of this species... 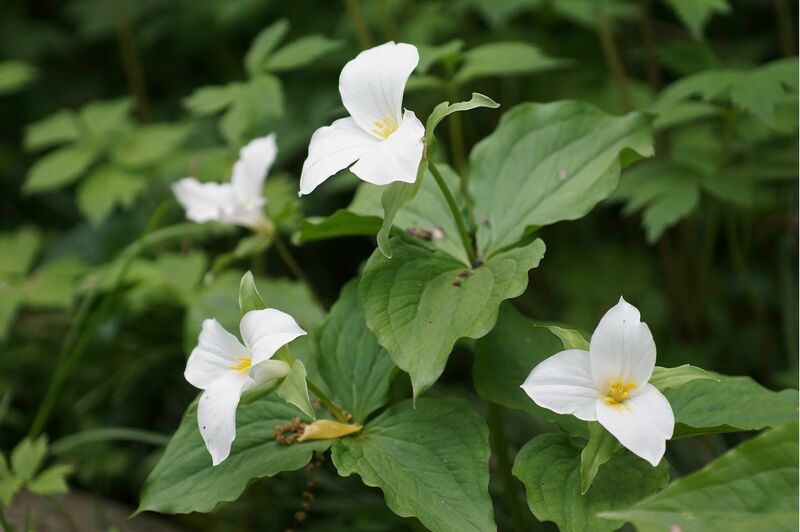 I'm not at all confident but the only other option is Trillium sulcatum. The problem is T. erectum should have much longer petals so it looks more like T. sulcatum, but T. sulcatum is supposed to be a much taller plant with more robust leaves.... you see my problem. In the past I had thought this was T. vaseyi but apparently they always have the flower hanging down under the leaves, so I can at least rule that one out. 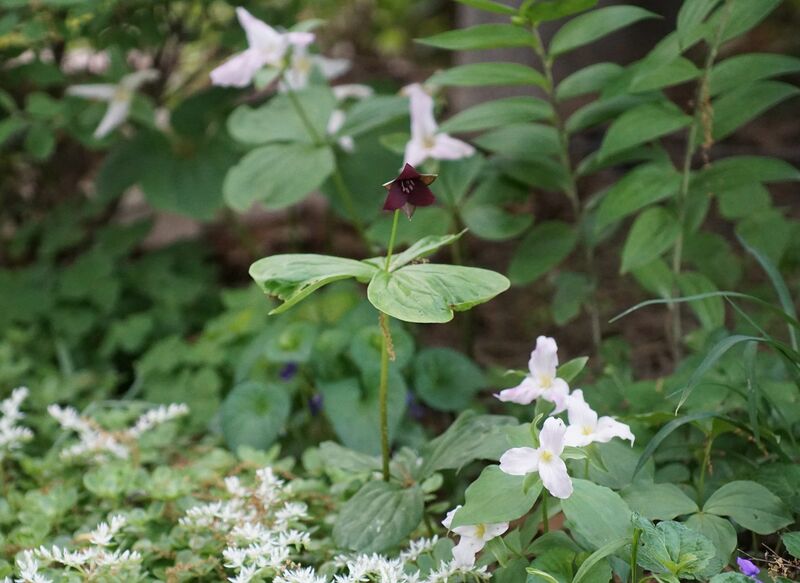 This was the main clump of Trillium grandiflorum last week. 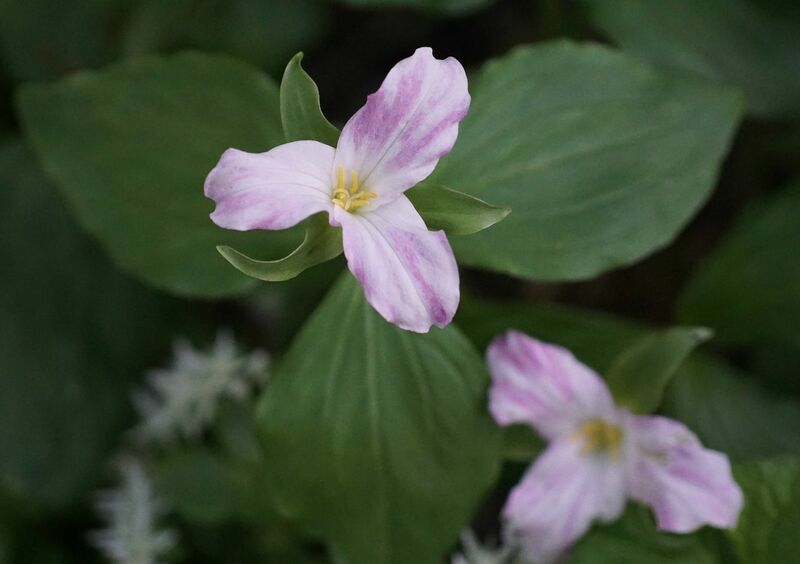 And here are some other Trillium grandiflorum plants a few days ago. They have pretty much faded now. Though the pink is pretty, it doesn't hold up to rain fall. The petals turn almost transparent and melt away. Still though, they are quite pretty.